Native to the high mountains of China, Korea, and Japan, dong quai has been used for centuries and is one of the most widely used herbs in traditional Chinese medicine. It is mainly used to help with women's health issues, including treating menopause symptoms. Dong quai contains phytoestrogens. A lot of confusion and misinformation surrounds phytoestrogens and how they act in the body. However, phytoestrogenic herbs contain plant compounds that act similarly to estrogen in the human body. Dong quai belongs to a class of compounds known as endocrine disruptors. This means that in a high enough dose, dong quai can interfere with a person's endocrine system, which is the system that produces and controls hormones in the body. Estrogen levels, which fluctuate and decrease during menopause, are the main factor responsible for menopause symptoms. This estrogen decline triggers common menopause symptoms like hot flashes, mood swings, night sweats, and vaginal dryness. Many women experience physiological and psychological symptoms leading up to and during their menstrual period. This is called premenstrual syndrome, or PMS for short. Dong quai and other herbal remedies may help women deal with these symptoms. However, if these symptoms begin to alter your quality of life, it is important to consult a doctor. Dong quai, along with a combination of other treatments, has been found to successfully treat menstrual headaches. Menstrual headaches are usually caused by fluctuating levels of estrogen. Fluctuations in estrogen are also responsible for the hormonal headaches that are often a symptom of menopause. 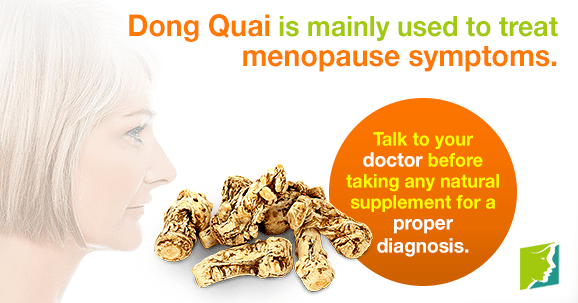 Therefore, dong quai may be able to successfully treat both menstrual and menopausal headaches that are caused by hormonal fluctuations. Some research has shown that dong quai may help to relieve menstrual cramps. This can benefit menopausal women, because women approaching menopause often experience menstrual cramps that are painful and erratic. Although some people have found dong quai helpful in treating a wide range of medical maladies and dong quai has been traditionally used in the East, there is no conclusive research that shows dong quai to be effective. Dong quai also has side effects, which can include increased sensitivity to sunlight and skin inflammation and rashes. Research done on dong quai is still in its primary stages, so further study is needed to determine exactly how dong quai works in the body and how it can help menopausal women. Talk to your doctor before beginning a course of any natural supplement for a proper diagnosis, dosage recommendation, and treatment.